We're proud to announce that in January, 2018, Gloucester County 4-H Club selected our fearless leader to receive their annual Erma Lentz Spirit of 4-H Award. Their announcement of the award is transcribed below. ​This award has been created in memory of Emma Lentz, honoring her more than 75 years of unceasing dedication and involvement in the Gloucester County 4-H program. 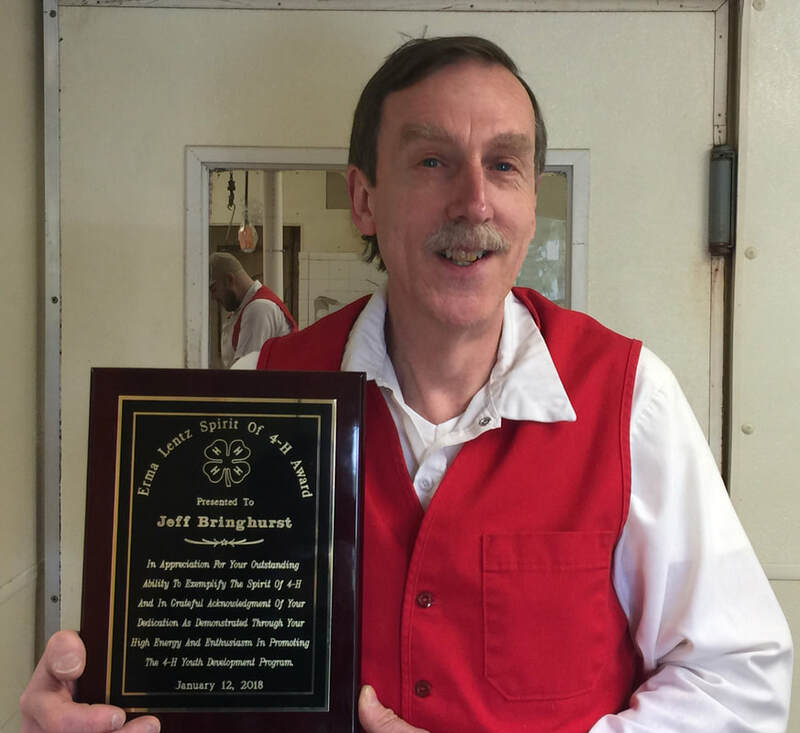 The honorees are chosen based on their ability to exemplify the spirit of 4-H through their 4-H involvement and dedication, accomplishments, demonstrated enthusiasm and energy, and promotion of 4-H.
Jeff Bringhurst is the epitome of what 4-H stands for. He encourages youth to be the best they can be in a supportive, humorous manner. Over the years Jeff has been a parent, volunteer, club leader, and Gloucester County 4-H Fair Association board member. Even after his own children had aged out of 4-H, Jeff remained active in the club and at the fair. ​As a leader of the Gloucester County Sheep Club, Jeff and his wife Terry were always there for every family. This included middle of the night phone calls and house visits to assist with a variety of different issues with the sheep. He housed members’ pigs, helped with sheep breeding and transported animals to and from the fair. In Jeff’s business, he has helped with the sale of 4-H lambs. If it wasn’t for his advertisement through his meat shop, we would not have had enough buyers for the lambs. ​Jeff also encouraged older members to take leadership roles in the club. Officers were in charge of running the meetings and helping out the younger members. A family atmosphere was encouraged and demonstrated by Jeff and his wife. Even though Jeff is no longer the leader of the sheep club he remains a positive influence to 4-Hers. He continues to help out at the fair when he can and is present to assist with animals whenever needed.